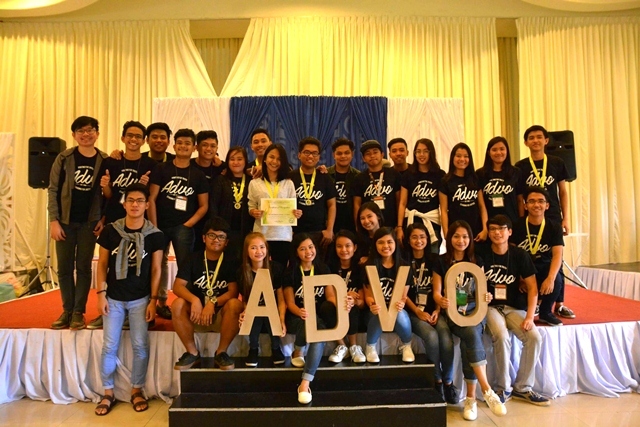 The Westernian Advocate (ADVO), official student publication of University of Batangas proved again their prowess as they ranked third in the Regional Higher Education Press Conference (RHEPC) held at Batis Aramin Resort, Lucban Quezon last January 11-13,2017. This year’s theme is “Propelling Change through Empowered Campus Journalism”. The group competed against students of Region IV-A. In the group contests held, ADVO grabbed the Best Magazine, while they raked the second place for newsletter and broadsheet publication. Meanwhile, the Tabloid issue landed fifth overall. ADVO’s Literary Folio, “Hubad” ranked tenth. In the individual contests held, Brahmans also made noise as Darlene Niel Panganiban, Editor in Chief, grabbed first place in Editorial Writing (English). While Patrick Ivan Ornales, Chief Artist and Ian Gabriel Culla, Property Custodian, both placed first in Editorial Cartooning, Filipino and Observer- English respectively. John Cedrick Custodio, Auditor,grabbed the second place in comic strip drawing and fifth place in graphic illustration. On the other hand, Mark Joseph Hernandez, Chief Layout Artist, captured the second place in Layouting and Kenneth Landicho, Art editor also made it to the second place in Editorial Cartooning (English). For Poetry Writing (Filipino), Francisco Andal Jr., News Editor-Internal made it to sixth place. Meanwhile, Daniel Angelo Gaviola, Senior Photojournalist and Angelica May Balmes, Senior Reporter, both notched the third place in Photojournalism and Feature Writing (Observer-Filipino) correspondingly. To complete the roll of the winners, Justine Khim de Leon, Business Manager ranked eighth in Photojournalism (Filipino) and Emmanuel Maala, Managing Editor, placed tenth in Editorial Writing (Filipino). “I believe that our publication did well in the group category and individual contests. We may not have won the first place this time but somewhere in the future, ADVO will finally clinch it once again. This I guarantee. “, shared Panganiban when asked about the experience in RHEPC and the preparations they will make as the top 5 winners will be given the opportunity to represent the region in the upcoming Luzonwide Higher Education Press Conference (LHEPC) to be held on February 21-25,2017 in Puerto Prinsesa, Palawan.